The WHAT DOESN’T KILL HER dedication is a thank you from our family and me on behalf of my now 95 year old father-in-law, a WWII veteran. On Veteran’s Day 2017, he and other veterans were celebrated in a ceremony at the local high school. The band played, the choir sang, one very brave trumpeter played Taps, and my father-in-law was presented with a quilt from Quilts of Valor, a wonderful program that makes quilts for our veterans. At the end, the students formed two lines for the veterans to walk through, honoring them and shaking their hands. It was inspiring to see such kindness and generosity of spirit. Thank you to everyone involved. You made one 93-year-old, and his family, very happy. 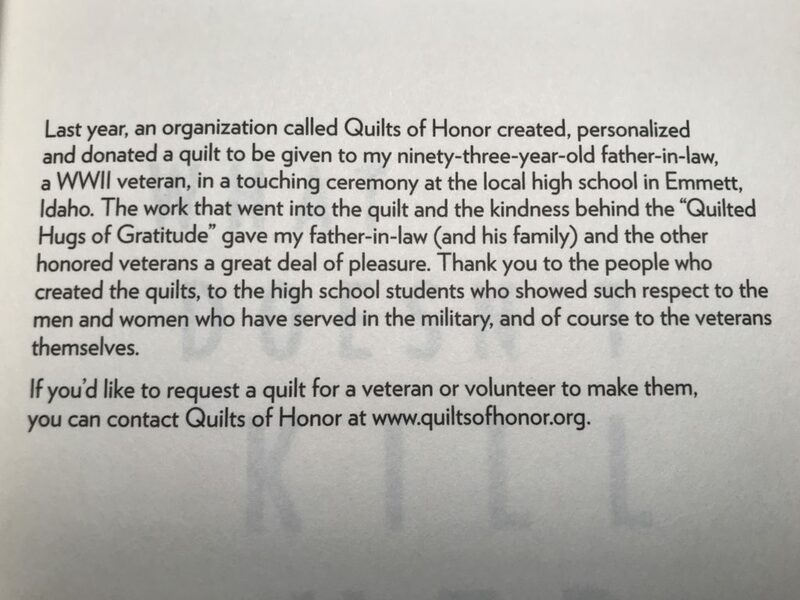 Last year, an organization called Quilts of Honor created, personalized and donated a quilt to be given to my 93 year old father-in-law, a WWII veteran, in a touching ceremony at the local high school in Emmett, Idaho. 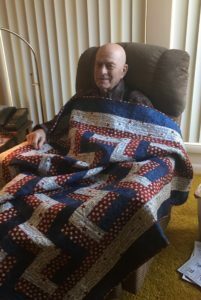 The work that went into the quilt and the kindness behind the “Quilted Hugs of Gratitude” gave my father-in-law (and his family) and the other honored veterans a great deal of pleasure. Thank you to the people who created the quilts, to the high school students who showed such respect to the men and women who have served in the military, and of course to the veterans themselves. If you’d like to request a quilt for a veteran or volunteer to make them, you can contact Quilts of Honor at http://www.quiltsofhonor.org/.